The Irish Sport Horse is a valuable resource for the sport horse breeder. Around the time of the Sydney Olympics, when our eventing team brought home the Gold on two Irish Sport Horses: Custom Made and Gilt Edge, I asked a representative of the North American Federation of Sport Horse Breeders if any of their member societies would allow horses with Irish bloodlines into their studbooks. The answer was no. She said that the members did not consider the Irish Horse a "breed" in the same sense as the member breeds were true sport horse breeds. She went on to say that they viewed the Irish Sport Horse as a crossbreed and so they felt that the Irish Horses were more of a type then a legitimate warmblood breed. To me it was interesting that Warmblood societies considered the Irish Sport Horse less than a "breed". I was aware from my pedigree research that Warmbloods are not pure-bred themselves. What I did not know at the time was that many of these same European breeds actually owed a huge debt to the Irish Sport Horse for their development into a sport success. 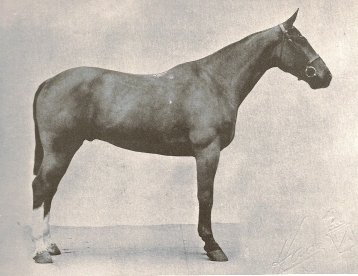 The Irish Draught, the source of the Irish Sport Horse, is itself a warmblood. Irish breeders, while not as organized and controlled as the European Warmblood societies, have nonetheless been selectively breeding for excellence in riding, jumping, field hunting, as well as driving qualities. If you are thinking: no, it is not the same thing as the European Warmbloods, which you believe were always more sport oriented--nothing could be further from the truth. Until very recently European Warmbloods performance tested for not only riding horse points, but also their ability to pull a plow or cart. There was a good reason for that--they are derived from a farm horse breed, with later massive infusions of first English coach horse, then English and Irish Hunters (Irish Sport Horses) and Thoroughbred. The sport focus in their breeding programs was only fully explored after WWII! The Irish Sport Horse is usually comprised of a mix of Thoroughbred with Irish Draught. Further, the Irish Draught and the Connemara Pony arise from a Irish Hobby base--as does the Thoroughbred, and the American sporting breeds as well. Indeed, modern DNA research (Hill 2008 & 2012, Bower 2010) has confirmed that the genetically the closest related breeds to the Thoroughbred are the Irish Draught and Connemara Pony. The Irish Hobby was an ancient saddle- racehorse breed, therefore the Irish horse was always a sport horse. On just a practical note, a sport horse society which is able to hold the #1 position world wide for over a decade in any Olympic discipline sport is truely a Sport Horse. But here is the ironic part. That sane, hardy, sound, athlete that the Irish Sport Horse is, were exported in huge numbers during the 1800's and into the early 1900's to improve these same European horses. These horses were then called Irish Hunters or Irish Half-breds, and were considered the best hunting horses in the world. It was common practice at that time, all over Europe, to send buyers to England and Ireland to purchase horses for their cavalry and breeding programs. In addition, many German warmblood breeds of that day also went to Mecklenberg to pick up what was considered the best of the Continental horses. However, most of these famed Mecklenberg horses were created from the breeds of the British Isles which included imported Irish mares. The Mecklenberg buyers sought especially those Irish mares who were of the Harkaway strain. According to the Irish Draught historian Alex Fell, the Harkaway Horse, was developed in the province of Ulster in Ireland. It was based on the cross of a Thoroughbred stallion: King of Trumps on the Irish Draught mares. In other words, what we would call an Irish Sport Horse today. These Harkaways were described as 16 to 16.1 hands in height, with good conformation and substance, with a great mind and work ethic, and usually a dark chestnut in color. They were a very consistent, highly prized strain, that bred true(Fell). Alex Fell, in her "The Irish Draught Horse" reported on this phenomenon of intense mass importation of Irish horses into Europe. To give us a window into this period, she used an example from the old export records, of a Mr. Oppenheimer from Hanover, a regular buyer in Ireland, who would purchase over 400 Irish mares a year! What we call the Irish Sport Horse today, was even back in the 1800's an excellent sport horse. The records show that Holland, Hanover and Mecklenberg imported huge numbers of them. Holland? Yup, the suitability of their "native" Gelderlander for the base of the Dutch Warmblood, owes a credit to the herds of Irish Sport Horses they used to improve the Gelderlander. Irish/Tb cross is 50% of the best eventers this country has seen. "high jumped". His record was 7 feet 1 inch. The two photos on this page are examples of those very same Irish Hunters that are at the base of most European Warmblood breeds. None of the Warmblood and Sport Horse breeds are pure-bred, they are all a work in progress. But there is more, my research on bloodlines has never stopped, and I have followed the sporting traits back through time. It has been an arduous process, requiring historical and DNA verification for so many pedigrees were falsified or not recorded correctly, plus in the various countries wars have destroyed records. But now many years later I can tell you sport ability goes right back to the Irish Hobby. Even the 'sport' lines in those heavily promoted warmbloods--declared far and wide to be the result of their lauded inspection process and their centuries of careful breeding. Contrary to their propaganda, and much to my own surprise, I have discovered in the process of extending pedigrees there is absolutely no proof of any sport line originating in Europe! Instead all genetic trails lead back to the British Isles and to a small, gaited race-saddle horse with a super nice disposition, called the Irish Hobby.